Leg Of Lamb With Crispy Italian Crust. Are you looking for a weekend dinner recipe? How about trying this Leg of lamb with crispy Italian crust? Preheat the oven to 180°C, gas mark 4. Using a sharp knife, make lots of incisions all over the lamb. Cut the Parma ham into strips and insert these into the holes, together with the rosemary sprigs, using the tip of a knife. Rub the olive oil all over the lamb and season. Place the lamb in a large roasting tin. 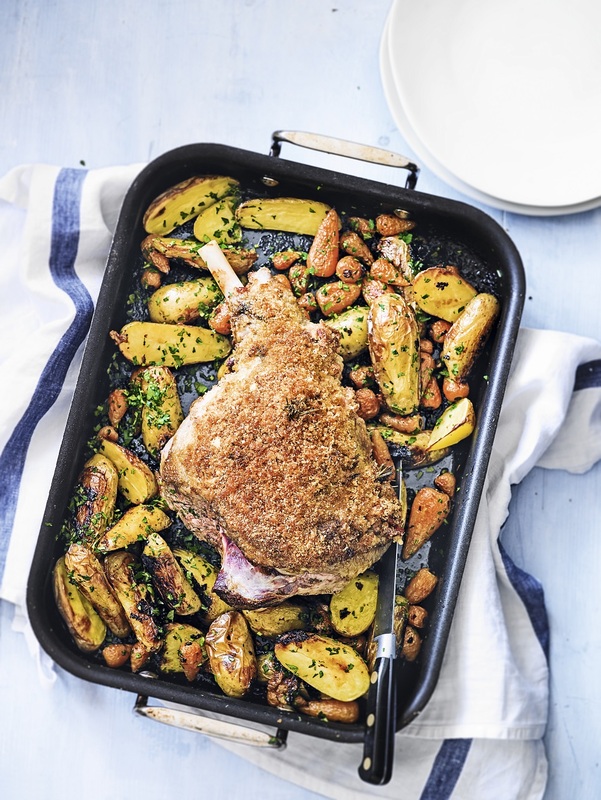 Mix the breadcrumbs, cheese and lemon zest together, and press all over the lamb, packing it down well with your hands until the top is completely coated. Pour the wine into the bottom of the tin. Carefully place in the middle of the oven and roast for 1 hour. Remove the lamb. Add the potatoes and carrots to the tin, and season. Toss well, place the lamb back on top, cover just the meat with foil and return to the oven for a further 1 hour. At the end of that time, remove the foil and return the tin to the oven for a further 30 minutes, or until the crumb coating is crunchy and golden, and the vegetables are tender. Leave everything to rest for 10-15 minutes. Sprinkle with the parsley and toss the vegetables in any cooking juices, then carve the lamb to serve. Recipes and images provided by Waitrose.com. 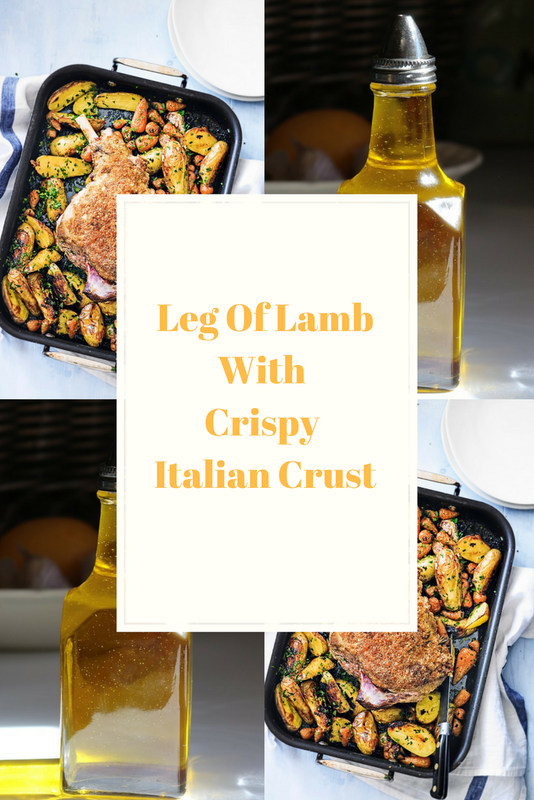 What do you think of this Leg Of Lamb With Crispy Italian Crust recipe? How To Make Jerk Pork And Shallot Skewers With Pineapple Salsa. Five Spice Belly Pork With Baked Rhubarb. How To Make Pineapple And Gorgonzola Toast. 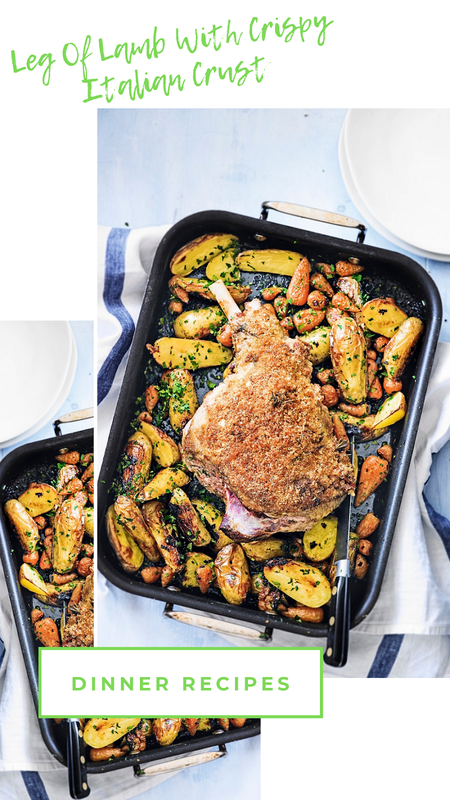 We love lamb and this recipe looks fabulous! Thanks so much for sharing this delicious meal with us at Full Plate Thursday, we will really enjoy it!